The Hall thruster is an electric rocket engine, which accelerats ions in crossed electric and magnetic fields in a quasineutral plasma. 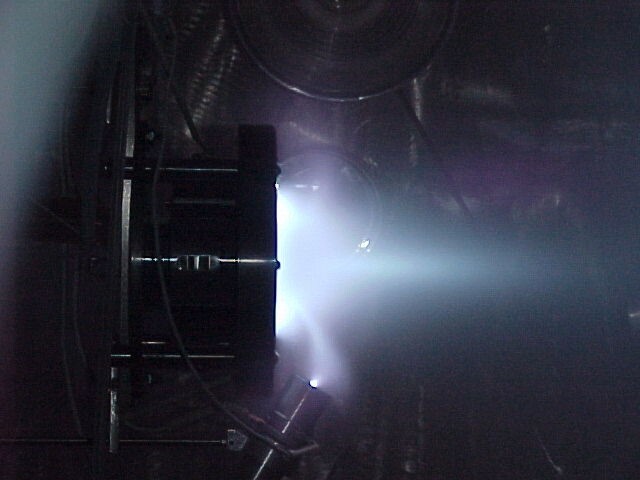 The PPPL Hall Thruster Experiment (HTEX) seeks to develop more efficient Hall thrusters for various space applications through better understanding of the physical processes involved in thruster operation. Control of spatial distribution of plasma parameters by using segmented electrodes in order to reduce beam divergence in the thruster channel and plume. Scaling of Hall thrusters to low (tens W) and high power (tens kW) levels. Control of plasma instabilities in crossed field plasma devices. Limitations of magnetic insulation in plasmas with magnetized electrons and non- magnetized ions. Exploring of new configurations of crossed field plasma devices for space, scientific and industrial applications. Steady state electrical discharge in crossed field devices under various pressures and gases. A 28 cub.m stainless steel vacuum vessel equiped with a 50,000 l/s (for air) pumping system. A 0.3 cub.m vacuum chamber equiped with 1500 l/s turbo pump. A few small vacuum chambers for different plasma experiments. Commercial gas flow control and measurement systems. 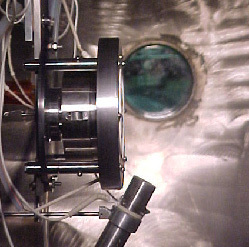 The first laboratory Hall thruster was developed and built in February of 1999. The thruster was designed to work at 1 kW power range by a linear scaling of its geometry relative to a subkilowatt Soreq Hall thruster. However, it has a magnetic circuit configuration different form conventional Hall thrusters in order to be able to work at 2 kW power levels and even higher. The first thruster start took place in March of 1999. Since then, the PPPL laboratory thruster has accumulated about 100 hours of operation, during the PPPL laboratory thruster has demonstrated the ability to achieve the-state-of the-art performance. The effect of segmented electrodes and their materials on ionization and acceleration processes in the laboratory Hall thruster at different power levels. The use of emissive spectroscopy for measurements of plasma properties inside and outside the thruster and for indirect characterization of the beam divergence inside the thruster channel. Scaling of Hall thruster geometry versus input power. Control of the location of a sonic transition point in Hall thrusters and its effect on thruster performance. Hall effect plasma acceleration in coaxial and non-coaxial configurations of cross-field devices. A breakdown and conditions for a steady-state electrical discharge in a crossed magnetic field with electronegative gases. Modifications of configuration and materials of the segmented electrodes in a 2 kW Hall thruster. Micro Hall thrusters of coaxial and non-coaxial configurations. A probe setup for measurements of spatial distribution of plasma parameters inside the Hall thruster channel. A thrust stand and diagnostic for a micro thruster characterization experiments. An experimental setup for investigation of interaction of a high flux plasma jet with magnetic dipole. A plasma source for plasma etching. Email Nathaniel Fisch or Yevgeny Raitses for more information on the Hall Thruster Project.